"There's no arson, there's no crime!" Roadside Attractions has debuted an official trailer for a true story drama titled Trial by Fire, the latest film from acclaimed director Edward Zwick. This premiered at the Telluride Film Festival last year, but not at any other fests. Trial by Fire tells the tragic and controversial story of Cameron Todd Willingham, who was executed in Texas for killing his three children after scientific evidence and expert testimony bolstering his claims of innocence were suppressed. It's an upsetting, moving story being told here by some incredibly talented actors. Jack O'Connell stars as Cameron, who looks a lot like Anton Yelchin in this, and the cast includes Laura Dern as a woman who fights for his freedom, plus Emily Meade, McKinley Belcher III, Chris Coy, Joshua Mikel, Jason Douglas, Jeff Perry, and Jade Pettyjohn. Well, this looks pretty damn good, with O'Connell giving yet another stellar performance. 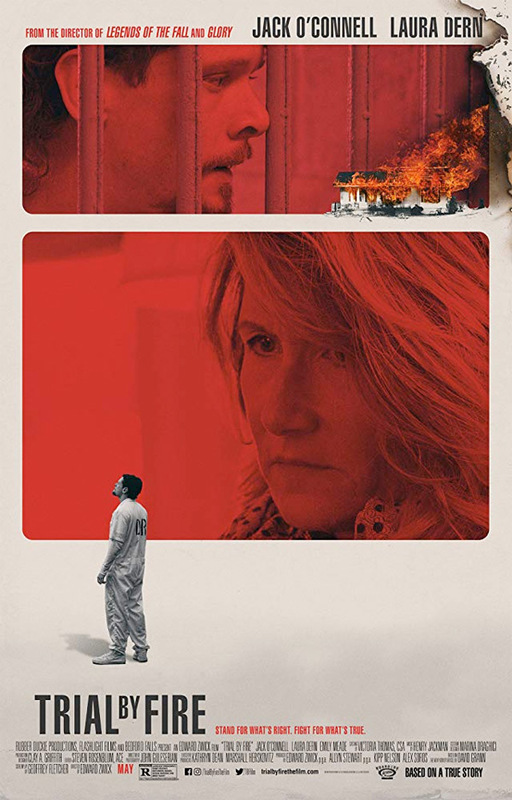 Trial by Fire tells the true-life Texas story of the unlikely bond between an imprisoned death row inmate (Jack O'Connell) and a mother of two from Houston (Laura Dern) who, though facing staggering odds, fights mightily for his freedom. Cameron Todd Willingham, a poor, uneducated heavy metal devotee with a violent streak and a criminal record, is convicted of arson-related triple homicide in 1992. During his 12 years on death row, Elizabeth Gilbert, an improbable ally, uncovers questionable methods and illogical conclusions in his case, and battles with the state to expose suppressed evidence that could save him. Trial by Fire is directed by American filmmaker Edward Zwick, director of many great films including Glory, Legends of the Fall, Courage Under Fire, The Siege, The Last Samurai, Blood Diamond, Defiance, Love & Other Drugs, Pawn Sacrifice, and Jack Reacher: Never Go Back previously. The screenplay is written by Geoffrey Fletcher; based on the New Yorker article by David Grann. Roadside will release Zwick's Trial by Fire in select theaters starting May 17th, 2019 just next month. First impression? Who wants to see this?